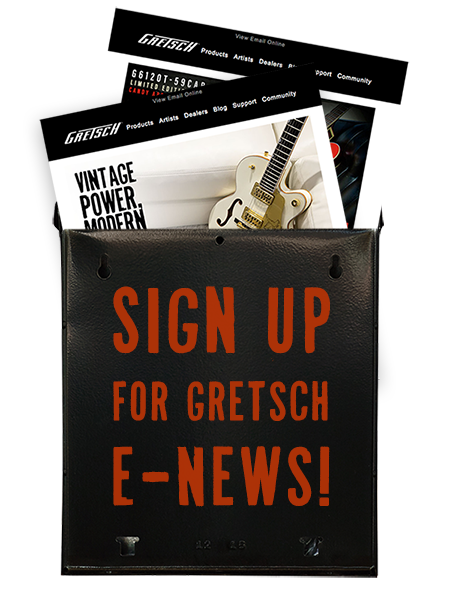 Nick Perri, who now plays with Sinai and has worked with artists including Shinedown, Perry Farrell and Matt Sorum, recently uncovered a great Gretsch discovery in his own family. The Gretsch guitar above still looks fairly new, but as Perri learned, it has quite the history. The guitar belonged to his uncle’s uncle, Jerold Daywalt, better known by his stage name of Jerry Kelly. Back in the 1930s, Kelly was a session heavyweight, playing with the likes of Bing Crosby, Bob Hope, Patti Page and the likes. He also had his own band, The Kelly Bros.
As a musician and fellow Gretsch artist, Perri enjoyed combing through Kelly’s scrapbook, and has kindly shared a few of those photos with us. Here’s Jerry Kelly with the Gretsch. A letter to Jerry Kelly from WQDX. Jerry Kelly with Bing Crosby, as well as a letter from Crosby.